Liverpool boss Jurgen Klopp was quick to praise midfielder Adam Lallana post-match after he was central to their 4-2 victory over Burnley in the Premier League at Anfield. 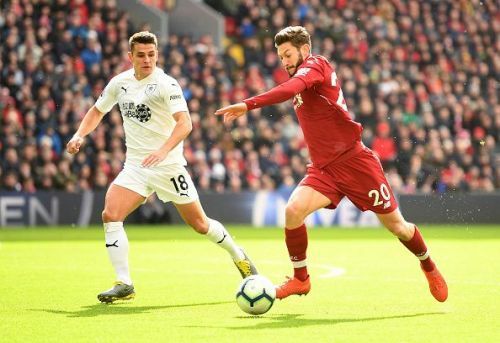 Making his first start for the Reds in over a month, Lallana's excellent block was the instigator for Sadio Mane's first goal, which put the Reds ahead for the first time in the game, and his pressing was a significant part of Klopp's strategy. Before the match began, many Liverpool fans would have been surprised to see the number 20 start ahead of summer signing Naby Keita, who came on late in the game, or Xherdan Shaqiri, who has slipped down the pecking order in recent weeks, but Lallana certainly vindicated his manager's decision. After the game, Klopp said: "It was clear that if he could play like how he trains, he'd help us a lot - that happened today. "The counter-press is a game-changer, it's a brilliant thing. Well done, well deserved, I'm really happy for him." Klopp had outlined before the game that Lallana had trained perfectly all week, hence his inclusion. Having struggled with injuries for the majority of the last two seasons, it was a big moment for a man most assumed had completed his most influential spell in a Liverpool shirt. Klopp explained: "If you have five sessions a week, everybody can show up and Adam was exceptional during the week. "In a situation where you think a little bit how you can adjust one or two things, it’s smart [to start him]. He trained well for a while already but this week was especially well." Whether Lallana retains his place against Bayern Munich in the Champions League last-16 second leg on Wednesday remains to be seen, but would appear to be unlikely. His previous injury record would suggest Klopp will not start him twice in the space of a few days, while a safer midfield trio of Jordan Henderson, Fabinho and Gini Wijnaldum is likely to be preferred. Lallana might, though, have done enough to ensure a more-than-sporadic role between now and May - providing he stays fit.